Robert Regis Dvorák, FAAR, is a painter who presents workshops on drawing and watercolor painting. 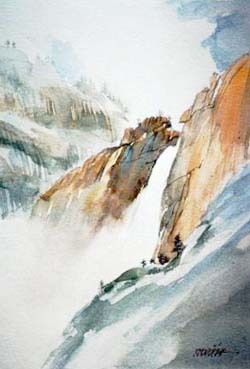 He teaches watercolor and drawing workshops in Yosemite and classes at the Art Activities Center there. He has authored four books on drawing including: Drawing Without Fear, Experiential Drawing, The Magic of Drawing, and The Pocket Drawing Book. His paintings and films are in major corporate, museum and private collections. When I came to the park for the first time as a child of nine, little did I know that I would be conducting drawing and painting workshops in the Valley during my adult years. Since 1977 I have visited Yosemite two or three times each year. I have made about 60 trips to the valley and have done over 2000 drawings and paintings. I've drawn and painted from the bottom and the top of Yosemite Falls, Vernal Falls, Nevada Falls, Illilouette Falls, Glacier Point, and Half Dome. I've sketched in the meadows, along the roads, on the trails, sitting on the bridges and even while lounging in the courtyards. 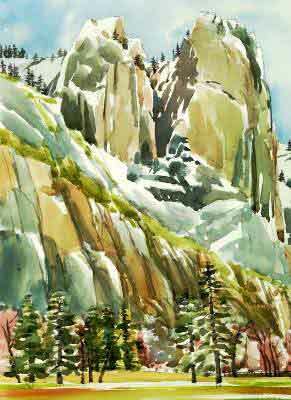 Many of my hikes were done after my annual Yosemite Valley Watercolor and Painting Workshop or during the time I was giving free art classes at the Art Activity Center. Yosemite National Park will open your eyes and heart while you are there. When you draw or paint the park, you will discover that you will begin to see and discover much more. The experience will enrich your visit to the park. I hope not only to motivate you, but also to inspire you to allow some of that unique creative energy that each of you possess to blossom forth during your next or first visit to Yosemite National Park. Admittedly, drawing and painting can be intimidating, but I would like to make it easier for you. There two reasons most people give for not trying to draw or paint are: They don’t have time and they are afraid they will look stupid or do something silly because they don’t have the talent or ability. The two biggest blocks to any artistic experience are time and fear. I would like to show you how easy it is to make simple drawings while you are in the park. Just pick up a pen and a sketch book and draw. One of the rewards we get from drawing and painting is the satisfaction of having a personal record of our visit. When I first came to Yosemite I was overwhelmed. There was so much to draw—meadows, cliffs, waterfalls, unbelievable vistas. 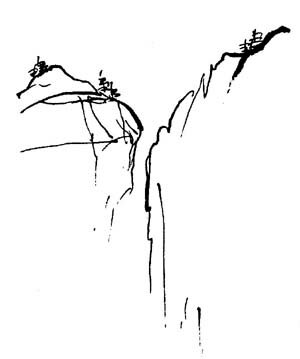 I knew that I couldn’t capture it all, so I started doing simple drawings of the striking cliffs. 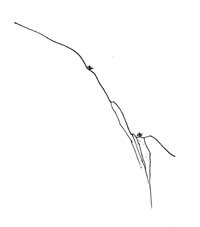 I tried to capture the magnificence of Yosemite with just a few lines on paper. Now you may be saying, that is fine for other people, but as for me I can't draw a straight line. Well, you are in luck. You don't have to draw straight lines to draw Yosemite. There are a lot of curved lines here too. Some of you think that you don’t have enough time to do this. I hear people say, “I don’t have enough time to draw.” Well, time is a relative thing. For instance, Yosemite is 11,070 square miles. You can fly over it in a few minutes. You can drive right through Yosemite in 2 hours. You can hike through the park in a matter of days. Time is related to space. The more you slow down, the bigger Yosemite becomes. You can take a photo of Half Dome in a few seconds. You can make a sketch in a few minutes. You can make a watercolor painting of the falls in an hour or two. If you were to choose between taking a photo or making a drawing, which experience do you think will give you the strongest memory? Take the time to see with your drawing pad while in Yosemite. The slower you go the more you will see. When you take the time to draw or paint, your park experience grows, becomes more profound and wonderful than if you had not taken that step into the world of creative expression. This is your reward for slowing down and drawing or painting. Wayne Gretski said, "You miss 100% of the shots you don't take." Some of my scribblings take only a few minutes. I work in a small sketch book. But when I look at these drawings, I’m transported back to the moment they were created. The little sketches I make in my pocket sketch book freeze time for me. They remind me of that experience--that time--forever. They also offer me a resource of material that I can paint from when I return to my studio. In Yosemite we don't need a studio, the park is our studio. Throughout Yosemite National Park’s history, artists have played a major role in the preservation and appreciation of this magnificent place. The natives that made this area their home created pictographs thousands of years ago. More recently, Thomas Ayers was the first European to sketch Yosemite’s wonders when he accompanied James Hutchings on a trip here in 1855. Others followed, including William Keith, Christian Jorgenson, Gunnar Widforss, and park resident and prolific painter, Thomas Hill. Even famous John Muir did sketches and watercolors of the park. So here we are in the year 2000 continuing a Yosemite tradition that is thousands of years old. Yosemite is one of the most inspiring places I have ever visited. I've traveled extensively in 53 different countries around the world. And I have drawn and painted in some very inspiring places: St. Peter's Square in Rome, in the crater of Haleakala volcano in Maui, Hawaii, while sailing the Greek islands, while hiking on the Great Wall of China, from the top of the Great Pyramid in Egypt. I like to think of the world as my studio and my life as a grand canvas.